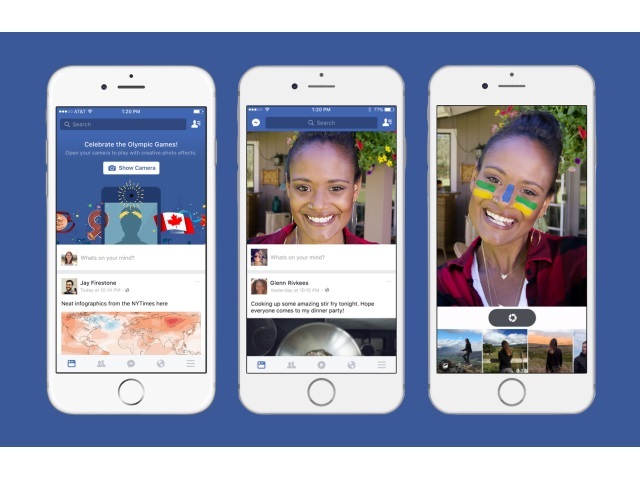 Facebook is running a test in which mobile users are shown a “Start Camera” prompt atop their News Feeds and given access to animated selfie filters from recent acquisition MSQRD. Josh Constine of TechCrunch reported that the test was rolled out to iOS and Android users in Canada, as well as iOS users in Brazil, and it will run through the end of the 2016 Summer Olympic Games from Rio de Janeiro in the latter country, the inspiration for the MSQRD animated selfie features that are included. The way that people share has changed a lot: 12 years ago, most of what was shared was text. Now, mobile changed things a little bit, but we didn’t really change our tools. If you look at what people are sharing, now it’s mostly photos, and soon it will be mostly videos. Our strategy is really simple: We want to make it really easy to share photos and videos. I think there’s a macro-level inspiration in the way that people are sharing on Facebook. The modern composer is not going to be centered around a text box–it’s going to be centered around a camera. Readers: Would you like to see Facebook roll this feature out to all users?